NSBR and I are trying to work up a little musical number for Christmas day with my family. My mother is playing piano duets with NSLR and S, and M is going to sing "Jingle Bells" with my brother. So R. and I want to do something with this gem, which we only discovered in the past year or so. Robbie Robertson strikes again (his "Broken Arrow" was one of "our" songs, and we were pretty outraged when Rod Stewart had a hit with it a couple of years later). So R.'s working on guitar, and I'm trying to come up with a descant on the mandolin. After a year of sporadically trying to learn cross-picking in my nonexistent spare time, I discovered that what Robbie George (Princeton professor and erstwhile bluegrass musician) told me in June is true: if you can play pizzicato on the violin, you can pick out a melody on the mandolin. But of course, now I want to play all these long, drawn-out notes. Please don't let me discover that I should have worked harder on the violin, that the violin was what I wanted all along. I want to make pretty mandolin sounds! I want to pick the living daylights out of that thing like Chris Thile! Buy a big jar of mincemeat and two boxes of ready-made pie crust (the kind that unrolls). Cut out circles from the unrolled crust with a 2 1/4 inch biscuit cutter and press into pan. Put a teaspoonful of mincemeat (and I mean a teaspoon from your flatware drawer, not a measuring teaspoon) in each one. 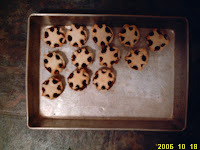 Cut stars to top pies (you'll need a star cutter that's on the small side). Press star points onto edges of bottom crust, although this turned out to be an empty exercise on my part. Bake at 375 degrees (in my sluggish oven) for 20 minutes. Cool in pan. Sunday night December 17th: not a good night to start idly paging through your Martha Stewart books. Why, why didn't I make gallons of preserves in July, hundreds of fruitcakes in October, and comb the antique stores for the perfect baskets and bowls in which to present my gifts. (Okay, I know in the case of the fruitcakes it's because I'm well aware that everyone hates fruitcake). But I did get all Martha Stewart-y on a small scale. The girls helped me strip the leaves off of a lot of lemon verbena I had drying in the attic. 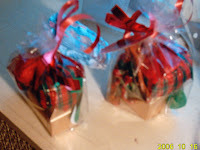 We cut circles from some plaid fabric I had hanging around and made little sachet bundles. We wove Danish heart baskets. Today I made stuffed dates (I roll them in sugar), for which I usually enlist S.'s help but she has strep throat again and that's not a gift I want to give. And then we packed all those things, plus the odd ornament or two, in with the Starbucks cards and voila! Teacher presents. Safe for another year. And without all that pesky canning. There's a song I am currently loving, and apparently the DJ at Lite FM is too. It has to be hard to listen to Andy Williams exhorting you to hang up your sock several times a day, so thank goodness there's Dan Fogelberg and his excellent Same Old Lang Syne. If you mix a box of Goya Mexican Rice with a box of Goya Red Beans and Rice, it turns out very well. *This tip only for people who intend to have children who attend school. Or insane people who actually like to make dioramas. On Saturday night we had takeout Indian with the N.'s, old friends of mine, and the B. 's, NSBR's sister and brother-in-law. JN and SB were on my right and left, so my end of the table was by far the more cynical end. We had Ben and Jerry's for dessert and NSBR commented, "Hey, this cookie-dough ice cream is pretty good!" SB began shaking with repressed laughter. JN and I looked at him inquiringly. "It's like going back in time," he managed to get out, "It's like hearing something someone said in 1987." We have officially gone over to the dark side: I ordered an artificial Christmas tree yesterday. It's not your father's artificial tree. Very realistic looking, and comes pre-lit. I won't miss the nerve-wracking process of putting the lights on, nor the shower of needles (some of last year's needles are still stuck in the front door threshold), or the necessity of watering. I'm hoping we use it long enough to save some money. But I will miss the fragrance, and it seems so LA (and thus wrong) to spray the thing with pine scent. Does anyone else remember Ice Bird? I told my parents I wanted this for Christmas when I was 3 or 4, and I can still remember the vehemence with which they informed me that I would not be getting one. Now my main reaction to the commercial is "Could that syrup look less appetizing?" They have changed the name to "Memory Bowling," and have a new sign that features a bowling elephant.